Habit: Annual, perennial herb, low, open, widely branched; sparsely to densely silvery-strigose. Stem: decumbent, 2--5 dm. Leaf: 2--16 cm; leaflets 9--21, 5--25 mm, +- widely elliptic. Inflorescence: flowers generally 20--40, early dense, then +- spaced, spreading or widely ascending. Flower: petals generally pink-purple, or cream with purple veins, petal tips, banner 7--10.3 mm, recurved 90°, keel 6.2--8.8 mm. Fruit: 10--25 mm, 5--14 mm wide, moderately to strongly inflated, +- ovate or half-ellipsoid, sparsely to densely strigose, papery but not especially thin and translucent; beak +- erect, 1/5--1/3 × body, triangular; chamber 1. 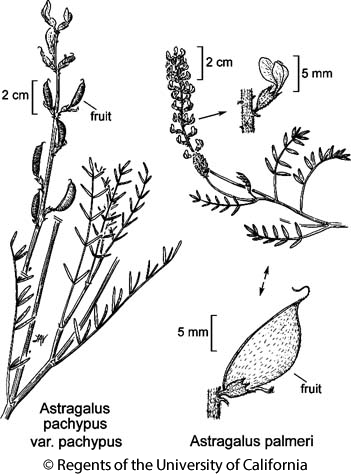 Citation for this treatment: Martin F. Wojciechowski & Richard Spellenberg 2012, Astragalus palmeri, in Jepson Flora Project (eds.) Jepson eFlora, http://ucjeps.berkeley.edu/eflora/eflora_display.php?tid=14978, accessed on April 20, 2019. PR, s edge DMoj, sw DMtns, w edge DSon; Markers link to CCH specimen records. Yellow markers indicate records that may provide evidence for eFlora range revision or may have georeferencing or identification issues. Purple markers indicate specimens collected from a garden, greenhouse, or other non-wild location.